Free online Koch polygon fractal generator. Just press a button and you'll get a Koch polyflake. There are no ads, popups or nonsense, just an awesome Koch flake generator. Press a button – get a Koch polyflake. Created by mathematicians for mathematicians. n-sided polygon Number of base polygon's sides. Angle Bend angle of zigzag segments. Background Background color for Koch's polyflake. Line color Koch polyflake's zigzag color. Internal color. Koch polyflake's fill color. Line Width Koch polygon's border width. Padding Padding around Koch's polygon. Select Direction Start drawing Koch's n-gon in this direction. Koch polyflake generator tool What is a koch polyflake generator? 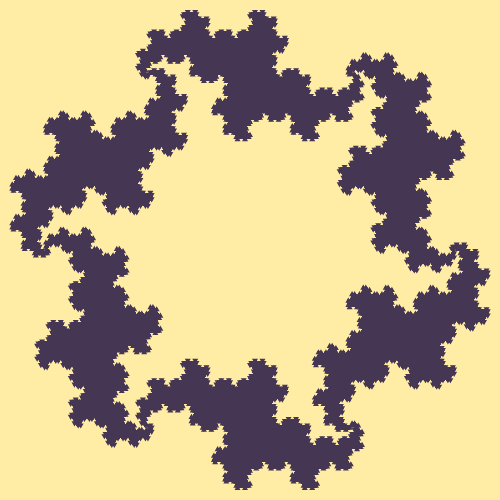 This tool generates Koch polyflake fractals. A Koch polyflake is also known as a Koch polygon, Koch n-gon, and Koch n-flake. 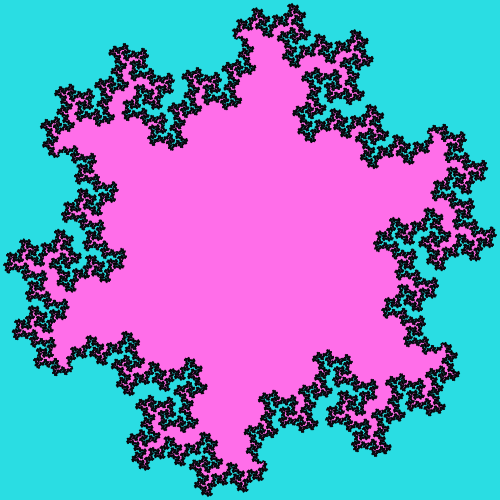 This fractal originates from the Koch triangle and it generalizes this fractal to any polygon. In the case of Koch triangle, each side of the triangle is replaced by a three-segment zigzag. With Koch n-gon, we are expanding your opportunities here. In particular, you can now select the base polygon of the fractal, as well as change the angle at which zigzag is bent. Furthermore, you can generate any number of iterations of this fractal and adjust the final size of the fractal. 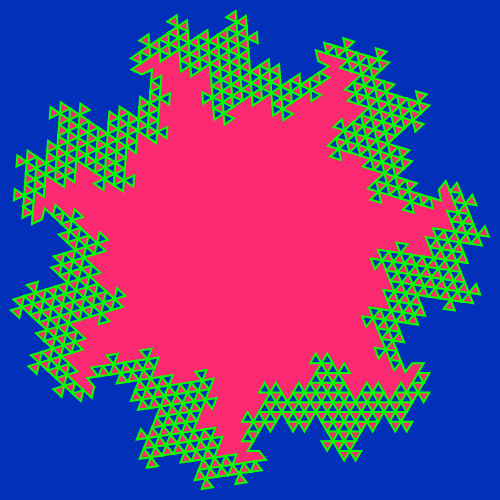 To make it more pretty, you can highlight three areas of the Koch polyflake in different colors – you can change the background color, the zigzag line color, and the fill color of the fractal. Last but not least, you can also adjust pixel width of the zigzag line and how much free space to leave between fractal and the drawing frame. And for the kicks, we threw in an option that lets you rotate the Koch n-gon around its center axis. Mathabulous! This example draws the Koch fractal from an equilateral 6-gon. The angle between the zigzag segments is 111 degrees. 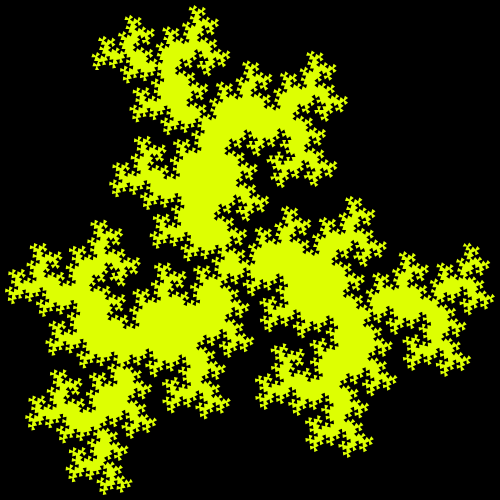 As we are generating 10 iterations of the fractal, the zigzag lines get so tiny and so close together that they delineate fractal's sharp, continuous edge. In this example we bend the zigzag line at 120 degrees. To our surprise, we get the Heighway triangle fractal. To show more possibilities of this tool, we've made zigzag's width equal to zero, set the background to black color and triangle fill color to white, changed fractal's size to a 500x400px rectangle with 5-pixel indentation along the edges of the frame. Here we've set the zigzag angle to the same as in the previous example (120 degrees) but because we take the heptagon (7-sided figure) as the basis for the fractal, we get something super interesting. The center shape that results has a solid fill but along the edges there are Heighway's triangles! We use bright colors to highlight each part of the fractal and generate seven iteration steps on a 500-pixel square canvas. In this example zigzag's angle is also 120 degrees, but here we disable fractal's fill color and get a hexadragon curve where dragons are connected heads to tails. These dragons are formed from Heighway's triangles, which you can see by reducing the number of iterations in the options. 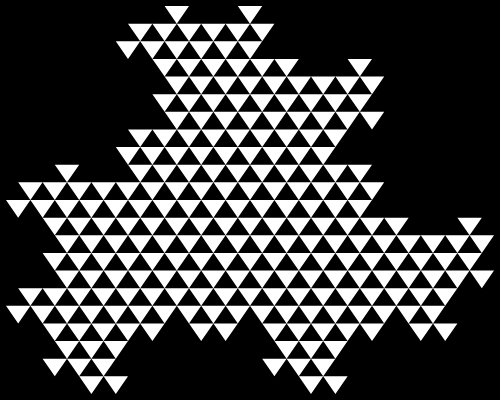 This example creates a Koch triangle fractal. As the title suggests, the base figure is a regular triangle and its sides are replaced with a zigzag made out of three equal-length parts that are cut at 108 degrees. We don't draw zigzag lines themselves and our fractal is drawn in yellow on a black background.